Many Island of Hawai‘i residents are familiar with the volcanic air pollution known as “vog.” The main culprit in the formation of vog is sulfur dioxide gas (SO2) released from Kīlauea’s eruptions (see vog.ivhhn.org/what-vog for more information). 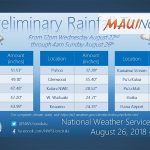 Vog watchers may have noticed significant changes in air quality on the island since early May 2018, when Kīlauea’s extraordinary lower East Rift Zone (LERZ) eruption began. Revisiting how much SO2 has been released from Kīlauea over the past decades helps us understand the island’s current vog situation. Since the amount and location of SO2 release from Kīlauea has changed over time, the concentration and distribution of vog on the island has also changed. Some residents may recollect clear skies in leeward Hawai‘i prior to 1986. During that period, Kīlauea’s summit was the focus of gas release, emitting just a few hundred tons of SO2 each day, which primarily impacted areas near the volcano’s summit. 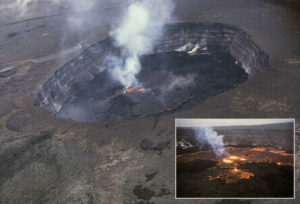 In 1983, Kīlauea’s East Rift Zone eruption at Puʻu ʻŌʻō began with episodic high lava fountains. During the fountaining, large amounts of SO2 gas (up to 30,000 tons) were released over a period of about a day, but only about once a month. Prevailing trade winds cleared the air between episodes. A few years later, the volcanic activity abruptly changed to nearly continuous eruption of lava and gas, with about 2,000 tons of SO2released daily. The continuous gas release provided little opportunity for the air to clear, and vog became a common feature for leeward Hawai‘i, where the trade winds blew the emissions. In 2008, SO2 emissions from Kīlauea, and vog on the island, increased significantly with the opening of the summit crater within Halema‘uma‘u, which hosted a lava lake for the next decade. During the past several years, summit SO2 emissions averaged about 5,000 tons per day, while Puʻu ʻŌʻō emissions progressively declined to less than a few hundred tons per day. The total gas release from Kīlauea in recent years (until early May 2018) was around 2.5 times those measured prior to 2008. In May 2018, significant changes in gas release accompanied the collapse events at Kīlauea’s summit and the LERZ eruption. These changes were even greater in magnitude than past changes. 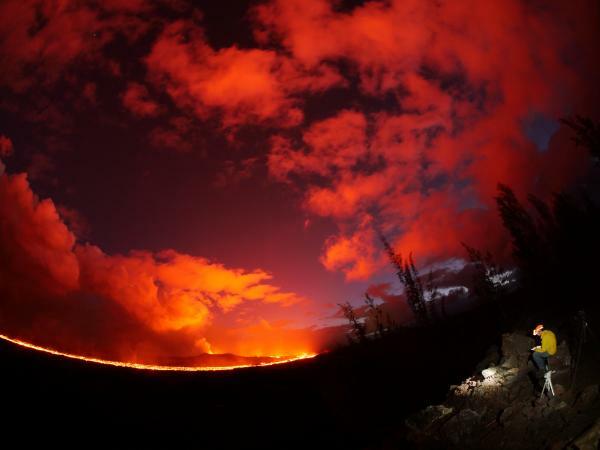 At the summit, ash-rich explosions in May produced SO2 emissions that peaked near 10,000 tons per day. Since then, as summit activity evolved into less explosive collapse events, SO2 emission rates have steadily declined. The latest measurements indicate that summit emissions are now only a few hundred tons per day, a rollback to pre-2008 summit emission rates. At Puʻu ʻŌʻō, SO2 emissions have rarely risen above a few hundred tons per day since May, a situation that continues as of this writing. Along the LERZ, the 24 fissures that erupted lava in and near Leilani Estates released massive amounts of SO2. Emissions in early May were similar to the long-term average emissions from Kīlauea’s summit lava lake. But as lava effusion became more focused at fissure 8, LERZ SO2 emission rates progressively increased. By early June, LERZ measurements indicated emission rates upward of 50,000 tons per day. These high levels persisted until early August. Sustained release of SO2 at such a high magnitude is unprecedented in Kīlauea’s history of SO2 emission rate measurements, which began in the late 1970s. When lava output from fissure 8 suddenly declined in early August, SO2 emission rates dropped precipitously as well. Emissions on August 3 indicated tens of thousands of tons of SO2 coming from the fissure 8 vent, but just two days later, on August 5, the emission rate was only around 200 tons per day. Since then, SO2 has further declined. With the LERZ emitting less than 100 tons per day, and Puʻu ʻŌʻō and the summit each emitting only a few hundred tons per day, the current SO2 emissions from all Kīlauea sources total well under 1,000 tons per day. This is the lowest overall SO2 emission rate in over a decade. Low SO2 emissions mean better air quality for Hawaii. While it’s not yet clear if the LERZ eruption is pau or paused, it’s worth taking a deep breath and enjoying the lowest SO2 emission rates from Kīlauea in a long time. 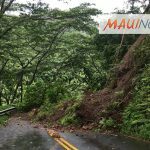 How Long Will the Current Kīlauea Volcano Eruption Last? Is the Current Summit Eruption a Return to Kīlauea Volcano’s Past?